The study, funded by the Medical Research Council (MRC) and published in Nature Biotechnology, suggests that embryonic stem cells could in future provide a potentially unlimited supply of healthy photoreceptors for retinal cell transplantations to treat blindness in humans. 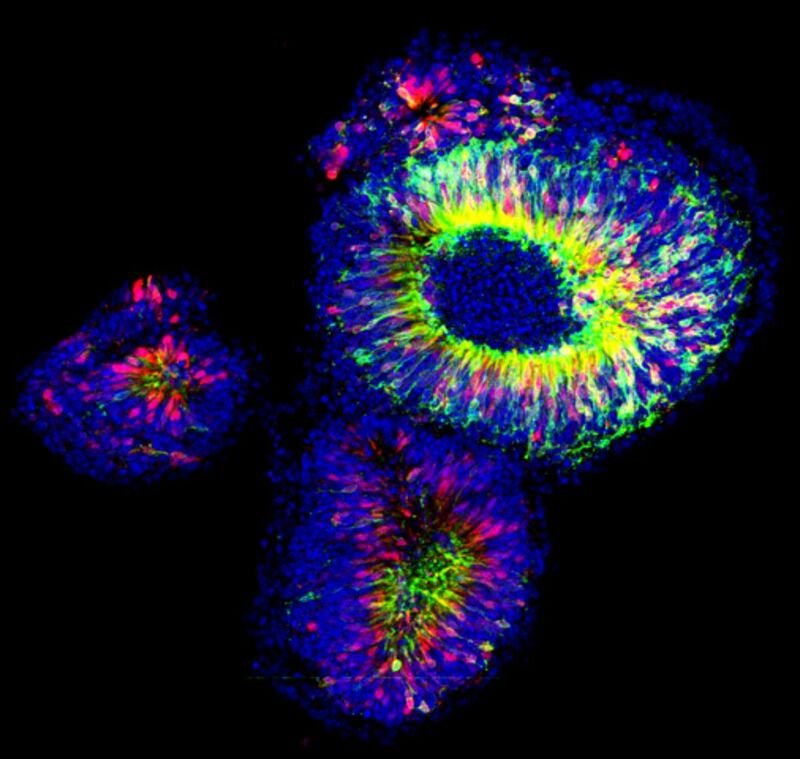 A cluster of nascent retinae generated from 3D embryonic stem cell cultures. The retinae contain photoreceptor precursors that express normal photoreceptor proteins, including the visual pigment, Rhodopsin (green) and the phototransduction enzyme, Recoverin (red). The precursors from such retinae can be isolated and transplanted into adult mice. Image by Anai Gonzalez-Cordero. 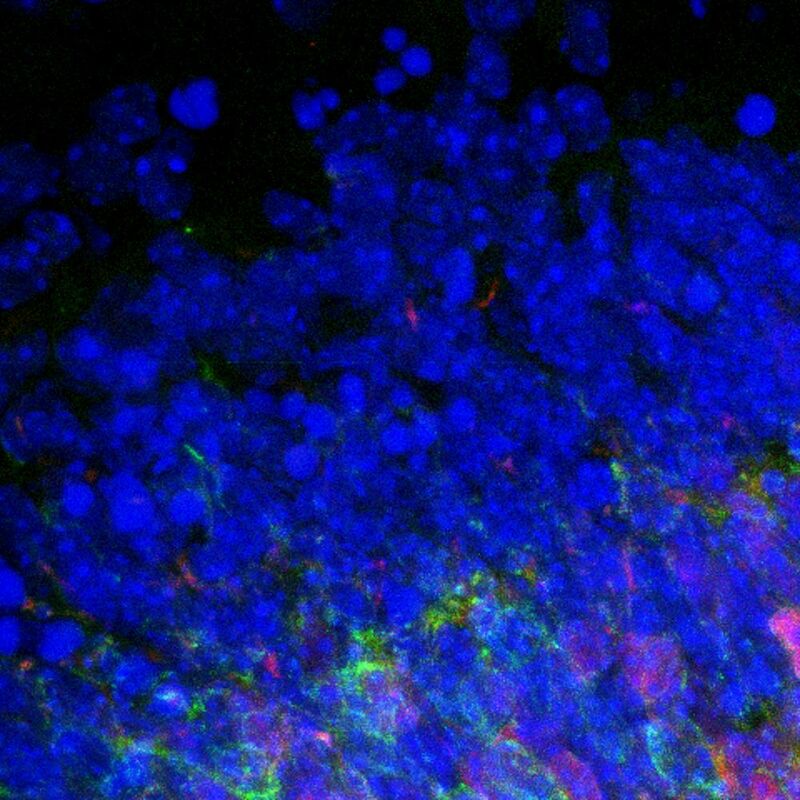 A nascent retina, generated from a 3D embryonic stem cell culture, containing photoreceptor precursors expressing normal photoreceptor proteins, including the visual pigment, Rhodopsin (green) and the phototransduction enzyme, Recoverin (red). The precursors from such retinae can be isolated and transplanted into adult mice. Image by Anai Gonzalez-Cordero. 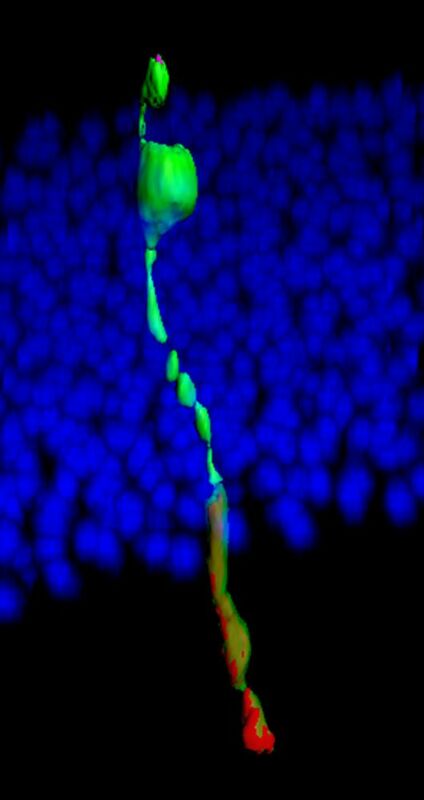 3D reconstruction of a transplanted photoreceptor (green) generated from 3D culture of embryonic stem cells. The newly integrated cell resembles a typical rod photoreceptor. Image by Colin Chu. Detail of integrated embryonic stem cell-derived photoreceptors following transplantation into a degenerate adult mouse retina. The transplanted photoreceptors express the essential phototransduction enzyme, a-Transducin (red) which is absent in the recipient retina. Image by Anai Gonzalez-Cordero. Professor Ali, UCL Institute of Ophthalmology and Moorfields Eye Hospital, who led the research, said: "Over recent years scientists have become pretty good at working with stem cells and coaxing them to develop into different types of adult cells and tissues. But until recently the complex structure of the retina has proved difficult to reproduce in the lab. This is probably because the type of cell culture we were using was not able to recreate the developmental process that would happen in a normal embryo. 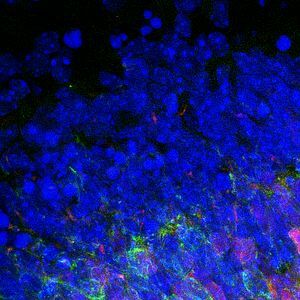 "The new 3D technique more closely mimics normal development, which means we are able to pick out and purify the cells at precisely the right stage to ensure successful transplantation. The next step will be to refine this technique using human cells to enable us to start clinical trials." Dr Rob Buckle, Head of Regenerative Medicine at the MRC, said: "Regenerative medicine holds a great deal of promise for treating degenerative diseases and the eye is one area in particular where scientists are making very rapid progress. This study is an important milestone on the road to developing a widely available cell therapy for blindness as it proves unequivocally that embryonic stem cells can provide a renewable source of photoreceptors that could be used in treatments."